The Dirty Pair "pays off"
These pictures are from an eBay auction announcement for the nine-laserdisc boxed set of all 24 broadcast TV episodes (1985), the two episodes ("#25 & #26") released as "From Lovely Angels with Love" (1987), and the ten OAV episodes (1987-88). The set, released on 15 September 1994 as VAP VPLY-70266, is known as Daatipea no Daikessan <literally, The Big Settlement of Dirty Pair, but better rendered as The Big Payoff>, which plays on the titles of most of the DP novels. 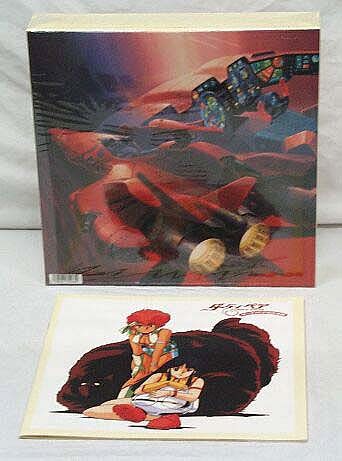 Here, you can see the front of the carton (beside the packing box), an interior spread from the informational book, and the nine laserdisc sleeves. The fronts of the sleeves each have a unique painting, showing the characters in a style appropriate to the episodes on the enclosed disc (TV or OAV episodes). The backs have portions of the ship painting, with the Angels superimposed, which can be assembled jigsaw-puzzle style; each has a listing of the episodes on its contained disc and a letter in a different typeface spelling out 'D I R T Y P A I R'. Yo, let's have a look at those jacket covers!